Ed Bruske, the author of The Slow Cook blog, is a personal chef and master gardener and teaches “food appreciation” at a private elementary school in the District of Columbia. He also blogs at Better D.C. School Food. Can you name a federal program that provides vital services to 10 percent of the U.S. population every day, yet has not a single reporter from the mainstream media assigned to cover it on a sustained basis? That would be the federal school meals $12 billion program, which feeds some 31 millions kids across the country Monday through Friday. As best I can determine, there is only one journalist who is investigating this program in any depth: me. And I don’t even get paid to do it. That, I thought, would be something for my blog: seeing food cooked from scratch at school. Boy was I in for a surprise. The first day, I watched the kitchen manager pull five-pound bags of something called “beef crumbles” out of the walk-in freezer. Made in a factory in Cincinnati from government surplus ground beef and processed soy protein, the “crumbles” were an odd, grayish color that looked to me like baker’s chocolate. She dumped them in a steamer for a few minutes, then stirred in some off-colored tomato sauce out of a can along with curly egg noodles also cooked in the steamer and some pre-shredded cheddar cheese. Voila: “Baked ziti!” she declared. “Fresh cooked” went downhill from there. The next morning it was “scrambled eggs,” meaning eggs cooked with 10 other industrial additives in a factory in Minnesota and shipped frozen, also destined for the kitchen’s steamer. Even the hardboiled eggs in Chartwells’ version of egg salad came frozen. But breakfast was the worst: The kids were pouring strawberry milk nearly the sugar equivalent of Mountain Dew over candy-colored Apple Jacks cereal. On the side they were eating Pop-Tarts, Giant Goldfish Grahams and swilling orange juice as well. I calculated that these grade schoolers—kids as young as five–typically were consuming 50 to 60 grams of sugar before they even started class. That’s the equivalent of 15 teaspoons of sugar. My week as a fly on the wall in an elementary school kitchen turned into a six-part series of articles, then an op-ed piece in The Washington Post. Apparently, it was the first time a journalist had staked out a modern school kitchen. Readers were so scandalized by what I wrote, they practically demanded that I find a school district that was making food right. Ann Cooper, the “renegade lunch lady,” arranged for me to spend a week in the central schools kitchen in Berkeley, CA. In Berkeley, I was handed a hair net, an apron, and a pair of Latex gloves and put to work. No chicken nuggets there. Cooper, who’d been hired by Alice Waters five years earlier to switch school meals made out of the same processed junk kids in D.C. were eating to food made from scratch, insisted on serving real chicken on the bone. My first assignment was to sort 1,400 pounds of government commodity chicken pieces, the first step in what turned out to be an eight-day process of brining, roasting and eventually serving that chicken to 2,350 kids in the Berkeley Unified School District. During my week there, I weighed pasta for shipping to outlying schools. I packed bins for simple breakfasts of organic cereal, plain milk and an apple to be eaten in the classroom. And every day around 11:25 I prepared to serve hordes of middle schoolers who descended on the “Dining Commons” at Martin Luther King Jr. Middle School for lunch. My supervisors during the week I played “lunch lady” were two highly seasoned chefs from the restaurant world. But as I discovered, the kids at Berkeley are really just like kids everywhere. What they wanted to eat was the same familiar food. Granted, it was cooked from scratch, often with locally-sourced ingredients. But it was still pizza twice a week, lots of pasta, chicken and even re-engineered nachos (lose the gloppy, Dayglo cheese, add freshly cooked beans). I wrote another six-part series (Berkeley). Now, all of my school food writings have been bundled together and presented as an ongoing series at the online environmental magazine, Grist. My reporting—my journey into the outer reaches of the school food universe—continues. I sit in on meals almost every day at my daughter’s school and take photos. The pictures and written analysis I gather now appear on a daily blog called Better D.C. School Food, the house organ of a parents group I helped form here in Washington to agitate for change in school meals. It’s a strange balancing act, trying to play objective journalist and food activist at the same time. But I think it’s fair to step out of my role as reporter for a moment and share what have I learned so far. 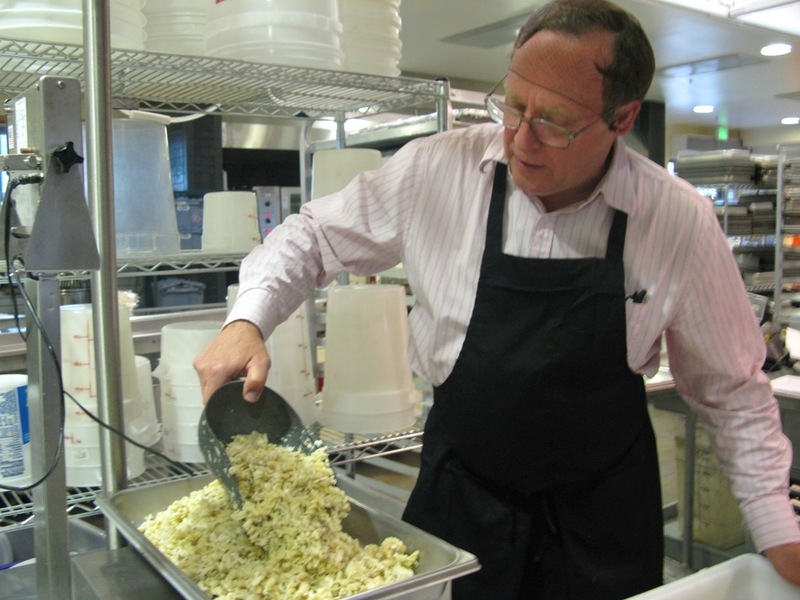 First, we could make school food healthier overnight. There’s no reason to wait for more standards or money from Washington. Simply remove all the sugary foods from kids’ meals. Did you know that in all of the hundreds of pages of regulations that govern the federal school meals program there’s not a single standard for the use of sugar? Insiders call it the “stealth” ingredient, a cheap source of empty calories. Thank the nation’s sugar lobby for blocking any regulation of its use in school food. And you thought we could solve the problem by getting rid of sodas? Second, disabuse yourself of the idea that just by writing more standards in Washington, we can improve the quality of school meals. The school meals program already has plenty of standards, but schools have proven in spades that they can easily translate those standards into lousy food. What really matters is the quality of the ingredients and how they‘re prepared. What does the food look like on the plate? Is it palatable? Will the kids eat it? Or are the vegetables cooked to death and destined for the trash bin, presented simply to satisfy the government’s idea of what a reimbursable “meal” should look like? As I learned, an acceptable “meal” can consist of re-heated potato wedges, a bag of Sun Chips and a carton of strawberry milk. Finally, there must be a reason why school meal programs have been driven into a state of perpetual poverty where the average school loses 35 cents on every meal it serves. Unfortunately, there exists on the local level a kind of circular firing squad where everyone blames everyone else for the poor quality of school food, but complaining is frowned upon because “we’re all trying as hard as we can.” Meanwhile, lawmakers in Congress and in state capitals across the country sit blithely above the fray, tossing pennies at the problem. I don’t normally subscribe to conspiracy theories, but the only people profiting from school food are giant food manufacturers like Tyson and ConAgra, and big food service contractors like Chartwells, Sodexo, Aramark. The folks with fat lobbying budgets are making billions serving kids frozen pizza and chicken nuggets. Photographs like the ones published here and on other blogs reveal school food as grotesquely out of synch with an emerging American food ethic that prizes fresh ingredients without additives grown close to home and cooked from scratch. The federally-subsidized meals program began as a conduit for America’s farm surplus in the Great Depression, became a weapon against hunger during the Great Society, and now seems to be groping toward a third incarnation: teachable moment in America’s struggle to embrace a healthful, sustainable diet. Is there any way school food can get there from here? Hold on to your hats, because it would certainly cost a lot of money, much more than what’s currently on the table, and perhaps even a complete re-imagining of the federal meals program itself. But if you are mad as hell about school food and don’t want to take it any more, you need to make your voice heard. And if you aren’t—well, maybe you need to spend some time in a school cafeteria and see up close what kids are eating. You just might be convinced to get involved yourself. "Is there any way school food can get there from here?" Looking forward to learning the answer to this question and how to accomplish it. Excellent post, Mr. Bruske! I very much enjoy your blog and admire the awareness you are raising. I am curious, can you please clarify why "the average school loses 35 cents on every meal it serves"
Like the bumper sticker says: If you're not outraged, you haven't been paying attention! Parents, teachers, students and health professionals: we need you to channel that outrage into meaningful action! Get involved. Eat a meal in the cafeteria, ask to see the ingredient list – it's different from the "nutrition information". Visit us, we're here to help! Over morning coffee I usually go from Mrs. Q, to Mr. Ed. What a nice surprise to get 2 in one this morning. I am dismayed by school food. Heck I am dismayed by most food in the grocery. My child doesn't eat school food. My oldest is pregnant with my first grandbaby though and I bet that child will be eating school food unless he has severe allergies like his mother. I don't want to be making organic babyfood for his first years to having him eat highly sugered, salted, fat filled JUNK for his school years. I feel Mrs. Obama's crusade is a start but as the rest of us know fighting big business is harder than a few sound bites. Real change is difficult in the face of a machine that has been working this since the depression. What started out as a way to get kids fed good meals so they could be fit enough to work or go into the military has left us with kids who aren't fit enough to serve in the military. Something BIG has to upset the applecart of the big companies and the USDA. What? What is the answer? I am a "lunch lady". And while I really hate the food that is served, there are some realities that would have to be dealt with in almost every school. First, most schools don't have a full kitchen. My school has 3 ovens, no stovetops, not even a steam kettle. That limits what you can cook. Second – cooler, freezer, storage and prep space. That limits your ordering capacity and food preparation. So it really comes down to money. Can a district afford to revamp each school's kitchen – in terms of both space and equipment? It's hugely expensive. And, of course labor and ingredient costs go up when you cook from scratch. And, lastly, if you are able to cook "fresh food", the kids may not eat it. I see kids from my school shopping at the grocery store with their parents. Carts full of the same processed food they get at school. Chicken nuggets, chips, soda. If you watched Jamie Oliver's food revolution, there has to be change at home, too, if you think kids are going to eat more healthfully at school. And that, there, may be the biggest hurdle of all. I agree wholeheartedly with your question: Something BIG has to upset the applecart of big companies/ the USDA and business as usual. Part of the answer is encouraging parents to look deeply into this flawed system and roll up their sleeves and do something. We need more Mrs. Q's and Ed's out there writing, photo-documenting and raising awareness. Once we build numbers, we can create a tipping point that will lead to a paradigm shift. We need every reader of this blog and others to do more than read! We're going to have to put our thinking caps on and take some action. Gayle – How old are these schools that do not have full kitchens? Did these schools once have this equipment but no longer do (old equipment died and was never replaced)? The A/E firm I work for designs schools (as well as other buildings). The kitchen equipment is sub-contracted out to a food service consultant. I'm going to look at some of our projects to see what kind of kitchen equipment is going into our newer schools. I quickly checked a couple school jobs we did. Elementary schools are definately being set up more as "warming kitchens". High schools are typically set up with more kitchen equipment to do "real" cooking. Unless elementary schools already have the necessary kitchen equipment and prep space, it looks like most new schools being designed are as "warming kitchens". Additional square footage and additional equipment equals additional money. Again, it comes down to money. Do we think that the general public is willing to put its money where its mouth is? Excellent piece, Ed, right in line with your other thorough coverage on the issue. "Where were the adults?" That's always the question. And in this case it's especially shameful because so many different factions have been complicit. And even when parents do make strides, there are obstacles. Including other parents. The need for education is huge. Absolutely devastatingly huge. Great guest post! I'll be subscribing to Mr. Bruske's blog and check out the article series on Grist. Thank you! Would it be possible to "turn off" the comment moderation so the comments show up immediately? Have you had problems in the past with inappropriate posts? I think the delay in seeing the comments kind of stiffles conversation. I love the work that you are doing. Breakfasts at our local elementary school are just as bad as the lunches, and children who eat both meals there are not getting the nutrients they need. Chartwells provides my college's food as well. It's freakin nasty. Now that I know what they consider "fresh cooked," I know why I got sick so often after visiting the dining hall. I have a few kids in the school system and not only did the school lunches appall me but also class room rewards!!!!!!. When my oldest came home from kindergarden with a tummy ache and the teacher called saying she was worried she wasn't focused I asked if she was giving her food at school. The list was this: A pretzel everytime they answerd a question correct, bubble-gum Friday, candy rewards and a box of junk like hostess cakes for prizes (NO JOKE) I don't buy tha stuff. No wonder she felt like she did and could not pay attention! I have to say the result of this at HER school was NOTHING!!!!!! Last year my daughter came into the car with a lolly pop because she had a 100% on a test. The six other children all said things like: my teacher gives a candy bar, mine has a candy bowl so we an go fishing for candy………. I do not understand why we reward healthy behavior with unhealthy habits! I make a stink about it every year and it seems to in one ear and out the other. BUT!!!!!!! My hubby is a principal and because of all this at our school he is activly involved in cafeteria choices. He also a few years ago installed a NO REFINED SUGAR policy at his school. This includes birthday treats, parties and teacher rewards. It was tough at first but the parents have gotten very creative and so have the teachers. He encourages the teachers to make healthy choices in front of students and I and so proud of the whole school. Hopefully more schools will follow suit! I don't have kids, I'm living on a pension, and I don't want to pay more taxes to feed your kids. xoxoxoBruce, I hear this (or similar) comments a lot and every time it makes me angry. I understand money is tight for you as it is for most people but I can't understand the comment about not having kids. I understand that you don't have children of your own but do you not realize that the kids you are talking about will grow up to run your country, be your doctors, lawyers…. to say you don't want to pay more taxes for children is saying you don't want to invest in yourself. Way to go. I been in Food Service for over 25 years and I spent an additional 6 years working in a Non Profit Environment. I can tell you the problem is complex, but the solutions is simple. Fresh foods can be served on a regular basis and cost effectively to school lunch programs. I did it, but the trend is to outsource the food to a contract company,then they find they made a mistake, but they continue to "go with it"